Get a play-by-play guide to implementing PLC concepts. Each chapter begins with a story focused on a particular challenge. A follow-up analysis of the story identifies the good decisions or common mistakes made in relation to that particular scenario. The authors examine the research behind best practice and wrap up each chapter with recommendations and tools you can use in your school. Get a compelling, accessible narrative to grasp PLC problems and solutions. Read the book cover to cover or select chapters for minilessons. Gain reproducible tools you can use in your own schools. Great book for schools headed into the priority school status. It explains the frustrations and stages that teams will go through to achieve their goals. Motivating and realistic as well as a quick read! Useful tools as well. Bill Ferriter and Parry Graham have put together a very accessible step-by-step guide on how to go about creating this kind of culture [professional learning communities], including ways to trouble-shoot potential challenges. 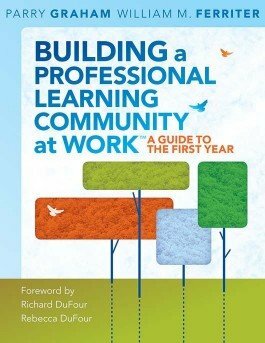 The questions that it encourages readers to ask themselves and their colleagues might be the most important parts of Building a Professional Learning Community at Work™. What an absolutely terrific resource! You’ve done a great job of organizing the book—starting each chapter with a real-life story and ending with a set of practical tools that are well thought out and tailored for the initiative. I guess my main question would be, what don’t I like about your book? It’s well designed, well written, and packed with useful stuff. Well done! I foresee a really bright future for you as an author. Most of all, I foresee bright futures for a lot of people because of you.